Every Friday morning our department eats breakfast together. We wander in at different times, sit down, heap up a plate, and talk about our weekend plans, Betsy’s newest crazy celebrity gossip, and (in the fall, since you can’t get away from it) what SEC teams are playing that weekend. It’s a lovely, longstanding tradition, and part of it is that every week it’s someone’s turn to provide the food. We all take turns, and usually I try to cook something for the crew. Now, if it were up to me, I’d make pancakes or a coffee cake and call it a day. But my co-workers tend to prefer things a little more on the savory side. Since I don’t eat ham or pig bacon or sausage, it narrows my options a little. 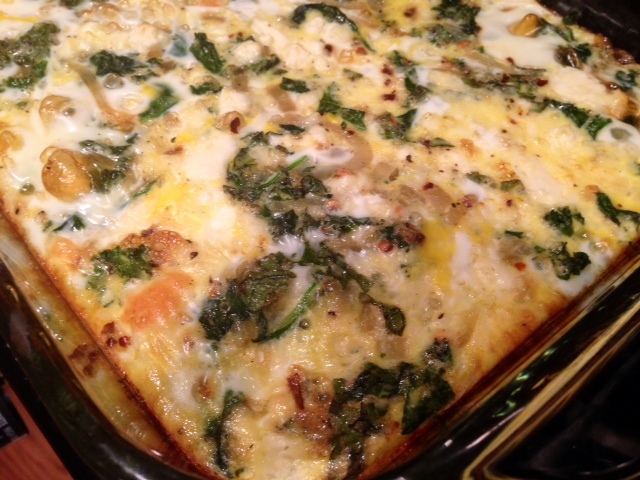 I’ve done a few breakfast casseroles, though most breakfast casseroles take a million ingredients, have way too many steps, and are EXPENSIVE! But last time I was super pressed for time and had to figure out something the night before, then found this recipe. 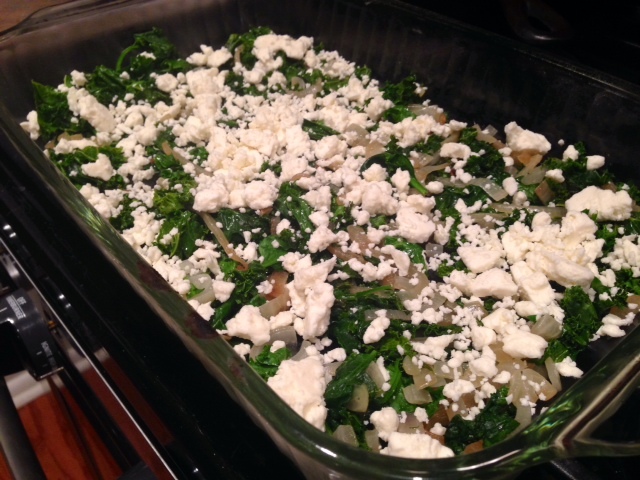 I loved that it only took a few ingredients, and the idea of feta in the casserole. I decided to give it a try and was surprised by how good it was. It got scarfed, and it’s definitely going into the regular Friday breakfast rotation! Preheat the oven to 375 F, assuming you’re baking it right away. You can saute up the veggies the night before and then just beat the eggs to throw in the oven quickly the next morning if you want. 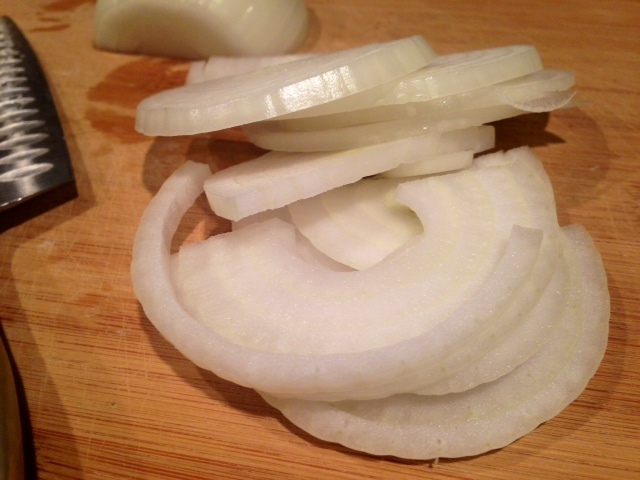 Slice the onion into thin strips, as if you were going to caramelize them. 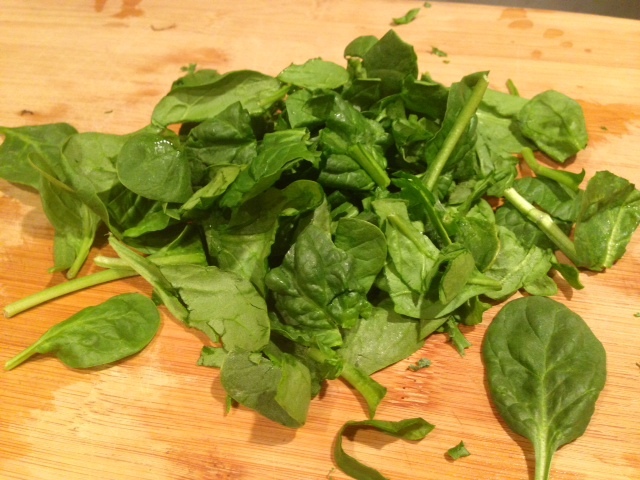 Wash the kale and spinach if needed, and spin dry or dry with paper towels, then coarsely chop. Heat oil in a skillet over medium heat and add the onions and a dash of salt, stirring constantly for a few minutes. They’ll start to become translucent, then add the kale and spinach. Stir until it’s wilted and starting to soften (but not soggy). Probably about 10 minutes total between the two. Spray a 9×13 casserole dish with olive oil or nonstick spray, then spread the wilted greens and onions in the bottom of the dish evenly. Crumble the feta over the whole thing. 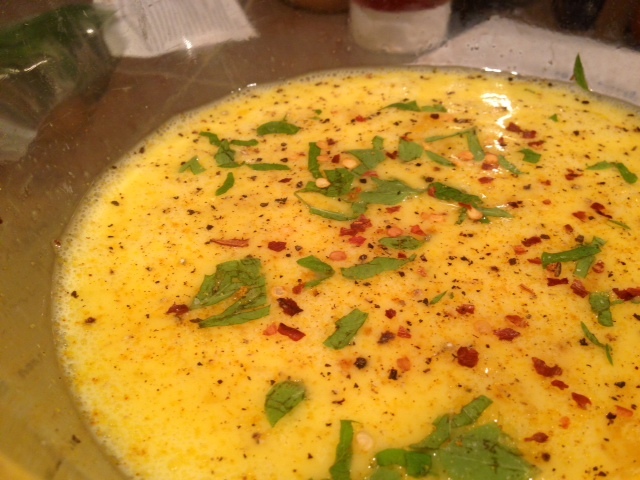 Beat the eggs (with a splash of milk if you’d like), and add all the seasonings, stirring everything together. I had a little fresh oregano I hadn’t managed to kill yet, so I threw a little of that in. Gently pour the egg mixture into the casserole dish, getting it evenly spread. Sprinkle a little shredded cheese on top—not gobs, which will create an impenetrable layer on top that makes it hard for the eggs to set up, but a little for flavor and texture. 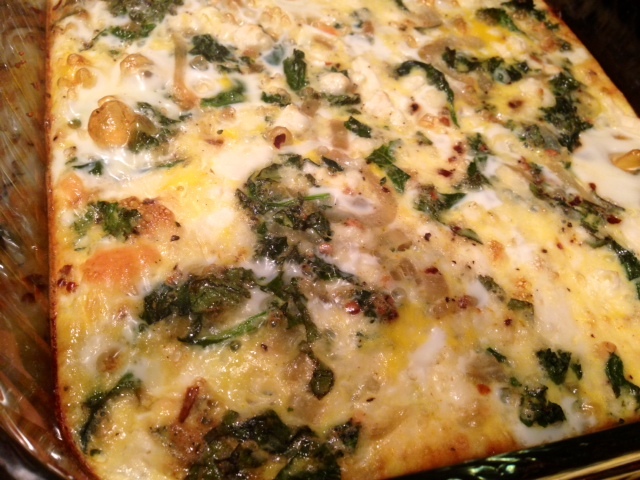 Bake for 30-45 minutes, until eggs are set and the top is starting to lightly brown. It was more like 30 minutes for me, because the eggs weren’t super deep. Serve right away if possible. Preheat the oven to 375 F. Wash the kale and spinach if needed, and spin dry or dry with paper towels, then coarsely chop. Slice the onion thinly, as if you were going to caramelize them. Heat oil in a skillet over medium heat and add the onions and a dash of salt, stirring constantly for a few minutes until they start to become translucent. 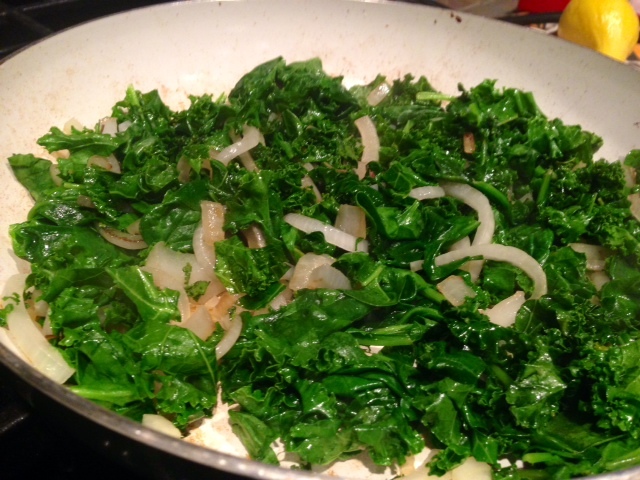 Add the kale and spinach, and stir until it’s wilted and starting to soften, about 3-5 minutes more. Spray a 9×13 casserole dish with olive oil or nonstick spray, then put greens and onions in the bottom of the dish evenly. 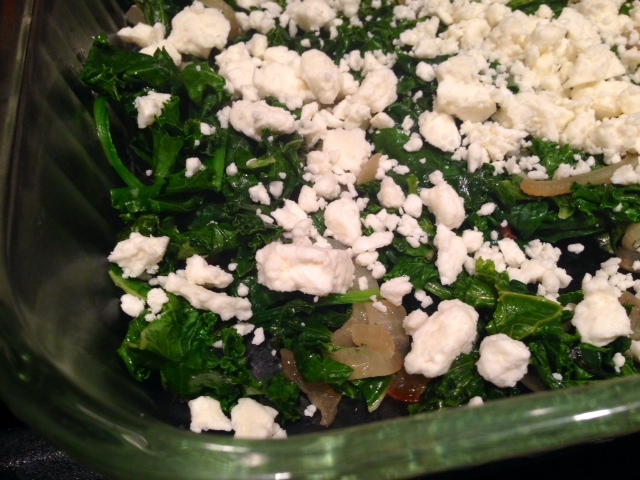 Crumble the feta cheese over the kale. If you need to make it the night before, stop here, cover with plastic wrap, and put in the fridge. In the morning just beat the eggs and bake (I get weird about having beaten eggs sitting in the fridge all night, since there’s not a lot of extra stuff in this casserole). Beat the eggs (with a splash of milk if you’d like), and add all the seasonings, then gently pour the egg mixture into the casserole dish, getting it evenly spread. Sprinkle a little shredded cheese on top—not gobs, which will create an impenetrable layer on top that makes it hard for the eggs to set up, but a little for flavor and texture. 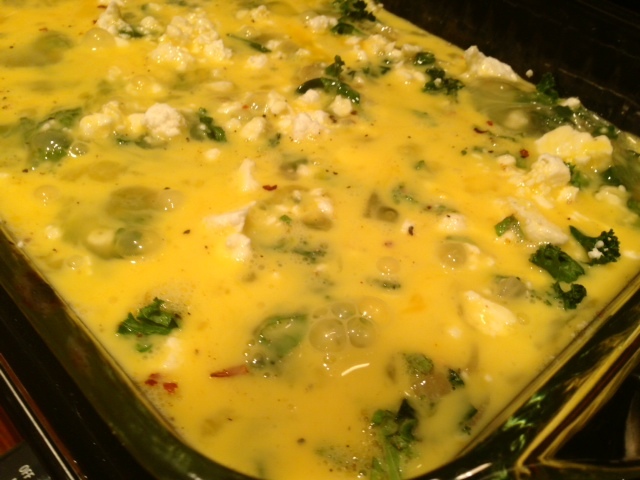 Bake for 30-45 minutes, until eggs are set and the top is starting to lightly brown. It was more like 30 for me, they cooked fast. Serve hot.